On 12 September 2016, an international team of researchers boarded the drilling vessel Chikyu, the world’s largest scientific research vessel, in Shimizu Port in Shizuoka, Japan, to begin a 60-day quest to determine the limits of life below the ocean’s floor. Working with six additional shore-based scientists, the team will attempt to clarify key factors, including pressure, limiting Earth’s underground habitable zone. Photo courtesy of JAMSTEC. Read more about IODP Expedition 370: T-Limit of the Deep Biosphere off Muroto. The Deep Carbon Observatory is beginning the academic year with a burst of opportunities, activities, and accomplishments. DCO’s Synthesis Group 2019 issued an open call for synthesis proposals for activities that synthesize and integrate deep carbon science, and DCO’s Deep Energy Community issued a third call for proposals for short-term projects. The Oman Drilling Project achieved an important milestone with the approval of permits needed to commence scientific drilling in the Samail Ophiolite, and you can apply to participate in the field work and detailed core logging activities. 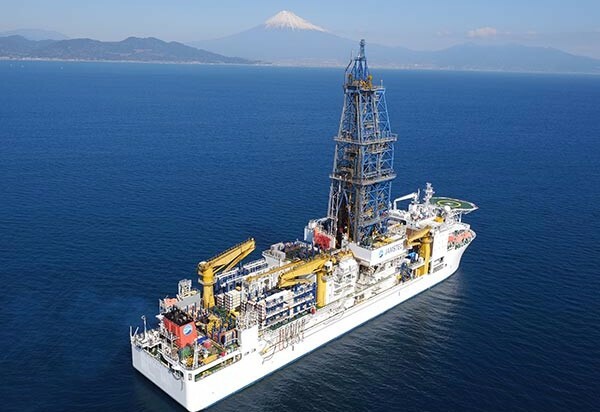 Our DCO colleagues embarked on a 60-day expedition aboard Japan’s $540 million drilling vessel Chikyu to explore the temperature limits of life beneath the seafloor. This research, which targets many DCO science goals, is part of International Ocean Discovery Program’s (IODP) Expedition 370. DCO colleagues played prominent roles in the Second European Mineralogical Conference in Rimini, Italy, which featured a series of sessions on DCO themes. Next week, DCO leaders will receive top honors at the 2016 Geological Society of America Annual Meeting. Donald Dingwell (University of Munich, Germany) will receive the 2016 GSA Arthur Day Medal, Anat Shahar (Carnegie Institution for Science, USA) will receive the 2016 Mineralogical Society of America Award, and Robert Hazen (Carnegie Institution for Science, USA) will receive the 2016 Mineralogical Society of America Roebling Medal; they will deliver award lectures and participate in special sessions in their honor. 15 September: Bon Voyage! IODP Expedition 370, here we finally are! 8 September: Why now, why me, and why the Nankai Trough? At the annual meeting of the Geological Society of America several sessions are of particular interest to DCO. This workshop will unite a broad range of participants interested in discussing the scientific motivations for an interdisciplinary Earth, ocean, and atmospheric research program, focused around scientific questions and societal hazards related to subduction zones. Throughout the remainder of its decadal program, DCO will focus on synthesis and integration, culminating in a wide range of activities and products by 2019. To encourage innovation and broad, creative thinking, DCO invites pre-proposals from all DCO Science Network members. DCO aims to arrange for funding of three proposals in this round, with a value of up to $50,000 each. We encourage applicants to look for other sources of leveraged funds to increase the scope of their projects. We will consider a variety of synthesis and integration activities, but they must combine data and knowledge from within communities or across different disciplines to advance understanding of deep carbon in Earth. The deadline for pre-proposal submissions is 25 October 2016. Washington University in St. Louis is seeking a highly motivated individual to assist in establishing and maintaining the new Noble Gas Laboratory in the Department of Earth and Planetary Sciences. Experience with ultra-high vacuum systems, mass spectrometry, and gas-processing methods is preferred. The new laboratory will be capable of measuring the full suite of noble gas abundances and isotopic compositions, and will be fully automated using Labview software to run 24 hours. To apply, visit the WUSTL jobs website and search for the job ID number 34204. Applications must be submitted through the website, and applicants should additionally send a CV and contact information for two references to Rita Parai. Postdoctoral position in geodynamical modeling, to work on newly funded NSF project entitled “Collaborative Research: Controls on along-strike variations in locked and creeping megathrust behavior at the Hikurangi convergent margin.” The project is an interdisciplinary, multinational program focused on the Hikurangi margin in New Zealand, aimed at evaluating processes that govern both slip behavior and long-term deformation at subduction zones via an integrated approach combining large-scale seismic imaging, paleoseismology, and geomorphology, focused through the lens of state-of-the-art numerical modeling. The successful candidate will have a PhD in geoscience, geophysics, or a closely related field; experience in quantitative modeling applied to Earth sciences is preferred. Applicants should submit a curriculum vita, a brief (1-2 page) statement of interest, and the names of three references here. Materials will be reviewed beginning 15 October 2016 and will be accepted until the position is filled. The Department of Earth and Planetary Sciences at Northwestern University invites applications for a tenure-track Assistant Professorship in geodynamics, to begin fall 2017. We seek a creative and innovative scientist to develop an active research program in the broad range of dynamic processes of the solid Earth and/or planets. Areas of specialization are open, but candidates whose expertise complements that of existing faculty in solid Earth geophysics, planetary science and habitability, natural hazards, seismology, and mineral physics are especially encouraged. The successful candidate is expected to teach both undergraduate and graduate level courses and develop a vibrant, externally funded research program. A PhD is required at the time of appointment. Review of applications will begin 15 October 2016 and continue until the position is filled. 12 September 2016: Gibt es noch Leben bei 130 Grad Celsius? Researchers analyzing the genomes of microorganisms living in shale oil and gas wells have found evidence of sustainable ecosystems taking hold there - populated in part by a never-before-seen genus of bacteria they have dubbed "Frackibacter..."
4 September 2016: Underground: How Deep Can Life Survive? A radio broadcast featuring Barbara Sherwood-Lollar (University of Toronto, Canada) and Gaetan Borgonie (Extreme Life Isyensya in Gentbrugge, Belgium).